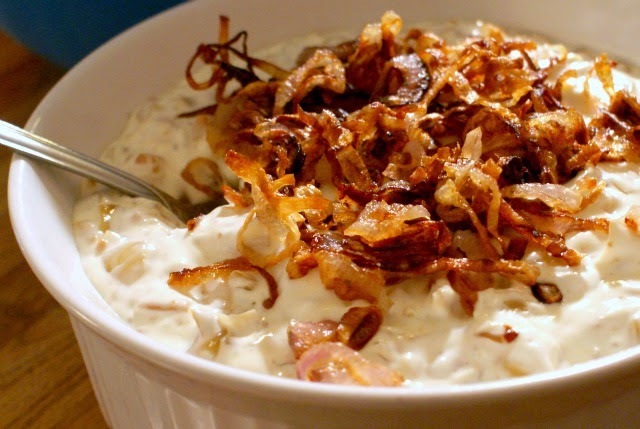 Caramelized Onion Dip with Bacon is a party-perfect cold dip full of golden sweet caramelized onions and bits of crumbled bacon that is garnished with crispy fried shallots. I made this dip for my son's birthday party and it was so delicious. How could it not be with all of those sweet golden onions and crumbled bacon! Have you ever caramelized onions? This dip has three pounds of them in it. You might think that that sounds like an awful lot of onion for one dip, but when you slow cook them over low heat, the characteristic spicy bite of raw onion is replaced by mellow sweet deliciousness. You'll be surprised at how sweet they get! The salty bacon is the perfect accompaniment to the sweetness of the onions. And the crispy fried shallots? Do you see those babies? They add the perfect texture to every scoop of dip. I loved them so much. As a matter of fact, I might even add more next time. I do have one word of warning, this make a big bowl of dip! If you have any leftover, I suggest trying it as a burger or sandwich spread! Any way you eat it, I know you will love it. I'll be making this one again and again! In a large skillet over medium high heat, fry the bacon until crisp. Crumble and set aside. Add the olive oil, onion, and salt to the bacon drippings. Reduce the heat to low and cook the onions, stirring occasionally, for 1 hour or until golden brown and caramelized. Transfer the onions to a bowl to cool. In the same pan over medium high heat, fry the shallots in the canola oil until they are golden, crispy rings. Remove to a paper towel lined plate. In a large bowl, combine the vinegar, mayo, and sour cream and pepper. Stir in the cooled onions and bacon, reserving a couple tablespoons of the bacon. Garnish with the crispy shallots and reserved bacon. If you're looking for a vegetarian onion dip, try my Homemade Onion Dip! Source: Adapted from ButterYum's Caramelized Onion and Bacon Dip. How nice to stumble upon this post and see that it was inspired by my blog. Thanks so much for linking back. Have a great weekend.